Since 2009, one of my main areas of research was the exploration of the sanctions regime imposed upon Iran and its multi-faceted domestic (power structure and state–society relations) as well as international effects (geo-economy). Key words | Iran sanctions, “smart sanctions”, “crippling sanctions”, coercive diplomacy, geo-economy, multipolar world, U.S. power, state–society relations in Iran, socio-economic development in Iran. Research findings | (1) The analysis permits to have a better understanding of the nature and workings of the emerging new world order, particularly the question of who commands most of international power in pursuing its goals. In other words, it will assist in critically evaluating the concept of interpolarity understood as multipolarity in an age of interdependence. (2) It calls into question the belief that globalization is an unrestrained force of economic integration that permeates the globe across national borders. Rather, it will be shown how geopolitical influence can restrain the spread of economic globalization – or put differently, how geopolitics mandates globalization. As such, it will add to the discussion about the geopolitics of globalization. (3) It shall be demonstrated that the results sanctions have produced can hardly be reconciled with the proclaimed goals as stated by those imposing the sanctions. Rather, the effects of sanctions seem to be in accordance to what the literature on sanctions would have predicted. Presentation of findings | (1) The findings have been encapsulated in a widely-read op-ed for Informed Comment in March 2010 (later republished in Canada, France, Switzerland and Germany) in which I argued that prospects for democracy, socio-economic development and conflict resolution will suffer if the West continues to rely on economic sanctions against Iran. The piece was probably the first critical exposition of Iran sanctions published in English. Moreover, I have written a detailed account of the Iran sanctions for Germany’s leading Middle Eastern affairs journal inamo (published in autumn 2010), which I updated in 2012 for a German news magazine. (2) These findings have been presented at numerous talks European-wide as well as at international academic conferences, incl. the ones held by the World Congress of Middle Eastern Studies (WOCMES) in 2010, by the German Middle East Studies Association (DAVO) in 2010 and 2011, and by the British Society for Middle Eastern Studies (BRISMES) in 2011 and 2012. Moreover, I have included important insights on the effect of sanctions on state–society relations in a book chapter entitled ‘Iran’s Civil Society: Grappling with a Triangular Dynamic’, in: Aarts, Paul & Cavatorta, Francesco (2013) (eds.) Civil Society in Syria and Iran: Activism in Authoritarian Contexts, Boulder, CO & London: Lynne Rienner, pp. 39–68. Praise | »[…] of particular relevance is the insight being delivered by Ali Fathollah-Nejad […] on the nefarious effects of the international sanctions on Iran’s civil society. He convincingly shows that economic sanctions widen the gap between the authoritarian state and civil society, cementing and even boosting existing power configurations while hollowing out social forces indispensable to a process of democratization.« (book editors Aarts and Cavatorta in an interview with Jadaliyya) | »I agree with [the] analysis and conclusions […] which is a depressing conclusion for the fate of civil society« (Sir Richard Dalton, UK Amb. to Iran, 2003–6). For years, I have been researching the possibilities of creating an inclusive security architecture in the Middle East. I have myself also been part of some initiatives towards that end (e.g. as Member of the Working Group “Common Security” of the Conference for Security and Cooperation in the Middle East (CSCME) civil-society project, spearheaded by the German branch of the International Physicians for the Prevention of Nuclear War (IPPNW), since March 2011; and as participant of the Academic Peace Orchestra Middle East). See also my article in the Palestine–Israel Journal of Politics, Economics and Culture. Most recently, I have been invited by the EuroMeSCo 2016 Annual Conference to present a paper on “Regional Security Architecture: Concepts, Initiatives and Realization Potentials” that will be published by EuroMeSCo within the next year (for my talk, see pp. 17–18 of the conference report). Conference for Security and Cooperation in the Middle East (CSCME) | Modelled after the “Helsinki Process” in Cold-War Europe, such a civil-society Conference shall deal with the Middle East’s multiple sources of conflict, namely territorial disputes, conflicts over the use of trans-border sources of water and energy, cross-border ethno-religious conflicts, the Israel–Palestine issue, the Israel–Lebanon conflict, and not least the issue of weapons of mass destruction (WMD). Arguably the most important theme is connected to the latter, i.e. to create a WMD-free zone – which of course includes the aim for a nuclear weapons-free region. Replacing the current regional (in-)security architecture by a concept of “common security” constitutes one of the most important political projects of our time. For instance, such an initiative could present a major breakthrough in the so-called Iran nuclear crisis. The “Arab Spring”, the expression of people’s demands for socio-economic justice and political freedom but also for national independence from outside powers, must also tackle the issue of (in-)security in the region, which was sustained by externally driven fault lines. I have made presentations on this topic, e.g. at the 2012 Gulf Studies Conference. See also the panel discussion [video | documentation] I chaired at the SOAS/British Pugwash London Conference on a Middle East Weapons of Mass Destruction Free Zone in 2011. 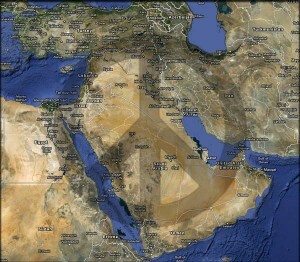 Nuclear weapons-free zone (NWFZ) in the Middle East | I have discussed this issue in a number of articles. To describe the emerging new world order of the first decade of the 21st century, I build upon the novel theoretical concept of “interpolarity” coined by Grevi. Interpolarity attempts to conceptualize the emerging world order after the end of both bipolarity (Cold War) and unipolarity (unrivalled U.S. global preponderance). Interpolarity is defined as multipolarity in an age of interdependence. Both of its constituent phenomena – multipolarity and interdependence – are viewed as being on the rise and deepening in the contemporary international system. In a world in which various (re-)emerging and established great-powers are all acting on the global scene, interpolarity suggests that the most decisive interactions take place between these poles – i.e. as a mostly inter-polar affair.